PetZoom Pet Park Indoor Dog-Relief System or Deluxe Dog-Relief System (Up to 54% Off). Free Shipping. Dogs mark their territory again and again using the PetZoom indoor Pet Parks’ synthetic-grass mat surface. The three-layer systems lures piddle-ready pooches with their convincing grass tops. A central grid tray separates paws from up to a gallon of pooling liquids, which gather in the lower base tray or the deluxe model’s slide-out base tray. 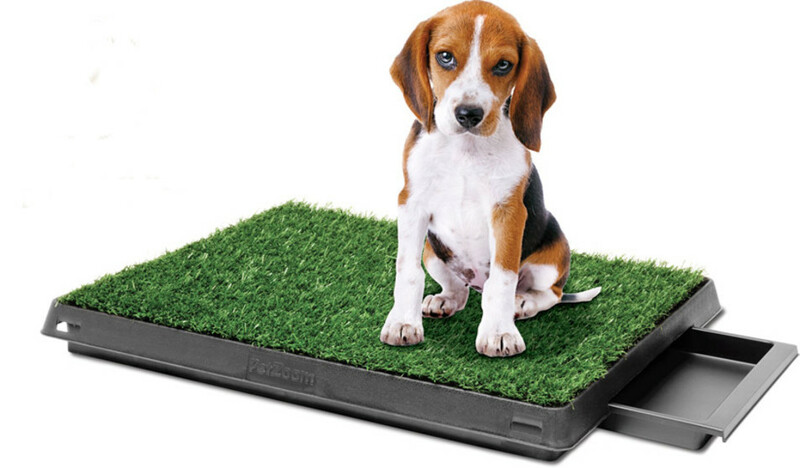 Ideal for housebreaking puppies and older dogs, the synthetic-grass tray keeps owners from having to rush home and teach pets to stop writing their name in the carpet. The Pet Park should be cleaned often with soapy water. Limit 3 per person, may buy 2 more as gifts. Free shipping. Does not ship to AK/HI/Canada/Puerto Rico.Most orders are delivered within 2 1/2 weeks from the purchase date. Does not ship to PO boxes. Final sale. No returns unless defective. See return policy. Must pay applicable tax and provide name and shipping address at checkout, which will be shared to facilitate shipping. Goods sold by Groupon Goods.